Copy Fein and get busy Festool. I will say this again. Festool and Fein likely have an agreement that determines when Festool will be allowed to introduce a cordless Vecturo. I hope that when Festool does come out with a cordless Vecturo, that they use the same battery platform that the new cordless sanders use. While adding another battery to the lineup, since it still uses the same charger, it is really not much of a hassle. So what is one missing with say a the Milwaukee M18 multi-tool? They look very similar, same specs, take the same blades, look to have a very similar blade lock design. This is one of those areas I don't see why people don't just look at all brands, since it's not like there is a dust collection aspect, or interconnect ability with other parts of a system. I had no interest in one for the longest time, but then bought one because it was the right tool for a job, and now like any tool you find more and more uses for it. But it's a free standing tool, only thing is I got the Milwaukee because I have a pile of tools that use that battery. Cost 99 USD as a bare tool. The Festool corded cost 630USD and you get a stand feature with it. That looks like a heck of a stretch that I can't think that stand attachment will get used much in real life. Huge price difference to be sure. As far as comparison I can only compare the Vecturo, Fein (MultiMaster), and Dremel. Vibration, power and cut performance I'd say the Fein and Festool are about the same. Dremel was dismal on all three. Whether or not the plunge base is worth the price difference depends on the use. I can tell you that I have used the plunge base at least half the cuts I have made. 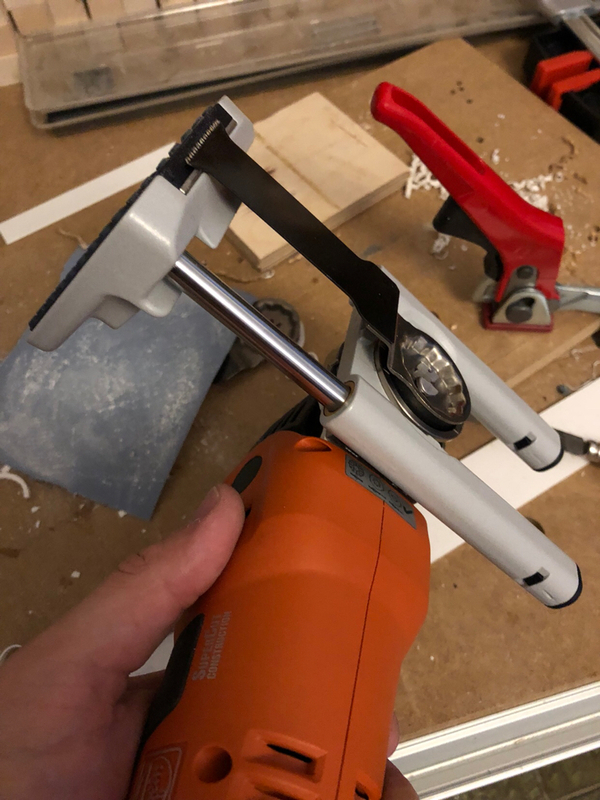 Probably the best thing it does other than better control and a little bit less flapping (widening the cut) is that you can align it to a mark / line before actually cutting. Makes it much more accurate if / when accuracy is needed. Just depends what you are doing. If the base is useful in real life, I can see it... maybe. When I see such attachments, or even ones that tools I have come with, they pretty much never get used, often because of setup time, or it makes the tool not fit in the space that the base tool is perfect for getting in. Also I suspect a lot of applications would be able to be done with plunge router+MFS setup. I can see them as maybe a jigsaw replacement for some jobs, as being a solution that might actually cut straight. Can't comment on vibrations, it's a oscillating tool, so there are going to be vibrations. Battery powered ones could help over cord simply due to having a large mass at the other end. I've only used my tool, no others so can't comment/compare. I find the noise being the big issue, hearing protection required tool. I saw these as a tool like rotozips, Dremels and other infomercial tools for a long time, but I now concede when it's the right tool for the job, they are great. The attachments just looking at it just give me the sense of working great in demos, but in real life, harder to find them to be the best answer. But for sure, if someone is waiting for Festool to bring a tool they don't have yet, I'd say there are options unless the Base is the sole reason for the tool. Router with MFS would cover a completely different set of uses. I am pretty sure that in the places I have used the plunge base there would be no doing it at all with router and MFS. Or it would require an extensive set up. I agree there are lots of gadgets that don't do much of anything useful, but the Vecturo plunge base is not one of those. It may not be useful at all for some people. Depends on the task. Making Vecturo cordless would be excellent and I think the Sander batteries would be a good fit. I haven't used the Festool's version, but Fein is vastly superior to Milwaukee. I have both, but Fein is corded, so I use Milwaukee for quick cuts or when dealing with a cord is a real hassle. Fein has very little vibration and tons of power, so you can make very accurate, burn-free cuts. Motor noise is also much more pleasant. I get a bit of tremor in my hands after using Milwaukee for 5-10 minutes. It also wants to walk away from the cut line, while Fein stays true and is a pleasure to use. 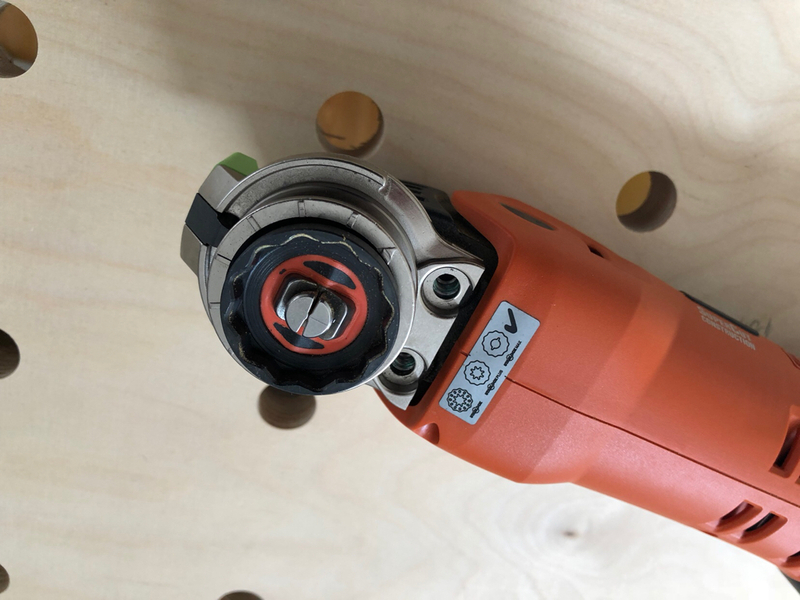 The quick-change mechanism on Milwaukee relies on a bolt that you have to screw and unscrew, while Fein doesn't need any of that. Also, Fein is Starlock-compatible, which keeps the blade clamped much better than the traditional design used in Milwaukee. While these details may seem minor at a first glance, they have a very significant impact when combined. Scenario: you need to cut a small 1" by 1" square hole in finished plywood. An oscillating tool is perfect for this. Milwaukee is too unwieldy and will most likely leave scratches on the material, it's hard to precisely follow the line with that tool. At the same time you won't have any issues when using Fein. I imagine using the base with Vecturo is even better, but it's just way too expensive to justify if you are not cutting small rectangular openings on a regular basis. I thought about getting the Vecturo, but didn't see value in paying 3 times over Fein for what I do. AvE did a review on both M18 and Fein oscillating tools, look it up on Youtube. He shows how much more of a "skookum choocher" Fein is. I haven't seen AvE's fein review, will go have a look. I watched his Milwaukee one before, and something I fully agree with him on is the switch setup makes for a widow maker. I've done the battery goes dead, swap new one in, took takes off because you forgot to turn it off when the previous battery died. First time it happened to me I just thought of him. I do consider it a dangerous tool because of this. I have 4-6 18v Festool batteries already and don’t want/need another battery platform . I would just by the Fein if that was the case. Btw I have never seen a multi tool perform like a Fein,the others I have tried are toys by comparison . What I want is a 18v starlock Festool version of the supercut. Some day ,or the day after I get the Fein. Hahaha. I'd prefer all the batteries to be the same too I was thinking that the "block " shape might not be so good on a Vecturo, but I see that the Fein (others?) has the block so , yes that would be better as long as it is not clunky. I went for the Fein, since I did not want to wait for Festool. If you go for the Supercut you get the advantage of a brushless multiVolt motor, which also lets you use 12V batteries to make the tool lighter. If you have a metal lathe or know someone who has, Adaption of the Festool plunge base is no issue..
Yep,I’m getting tired of waiting also. Do you use the Festool base very often ? I have the corded supercut and love it ,came in a systainer ,but I use it to much to put it in the box. Again, because the Festool sander batteries use the same charger as your Festool 18v batteries, it is not really a second battery platform in my mind, like say adding the Festool CXS is because it requires a second charger. I also think the lighter sander batteries would be less noticeable in the handling of the Vecturo than the existing 18v batteries would be. Of course I am approaching this issue from the perspective of someone who already has several of the sander batteries, and would like to find some way to expand their use (much like I did with my Festool 18v when I purchased the Festool Sysrock). I enjoy the base, since it makes a quick straight cut on small stock easy and quick. I also like the Festool depth-stop that you can get bundled with the plunge base a lot more than the Fein one. Especially since I got the 12V battery, I find more and more uses for it. What I can also highly recommend is the contour sanding kit. Different cork pieces to sand into slots and on profiles. Would be nice as the option to also run on mains makes a cordless model more interesting in my view. Unless switching to a brushless motor is enough to drastically reduce the power requirements for a cordless version. I just widened the hole, checking for fit once a while. If you measure, I think there is roughly 1.5mm of material left on the thinner part of the collet. Otherwise you need to shorten the area below the mounting holes and also add a 3mm (I think;) ) spacer to get the blade to align straight with the plunge base. If the base is useful in real life, I can see it... maybe. When I see such attachments, or even ones that tools I have come with, they pretty much never get used, often because of setup time, or it makes the tool not fit in the space that the base tool is perfect for getting in. I already owned an older Fein unit, however I purchased the Vecturo specifically for the base option. I use it for obtaining nice square cuts on oak and maple flooring to weave in new boards. I also use it to get square cuts on installed wood floors when installing HVAC vents. I recently needed to shorten a length of base molding that was already installed. Rather than pull it off the wall, I shortened it in place using the Vecturo & its base. I too ordered the Fien , tired of waiting. ...and now there is one coming!